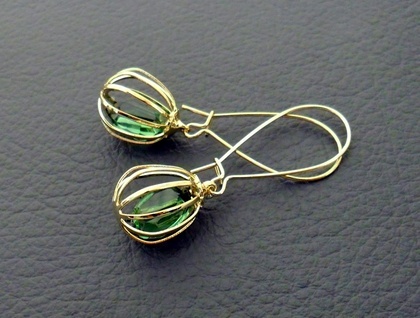 Gold plated cage charms hold small green 'jewels': vintage Swarovski crystals from the 1960's. Swarovski brand crystal is generally recognised as the best crystal in the world. It comes in beautiful colours and is incredibly sparkly. Vintage Swarovski crystals are difficult to obtain nowadays, and are in fact a collectors' item. I do not know the official Swarovski name for the colour of these crystals, but they are a fresh, gentle, leaf-green. 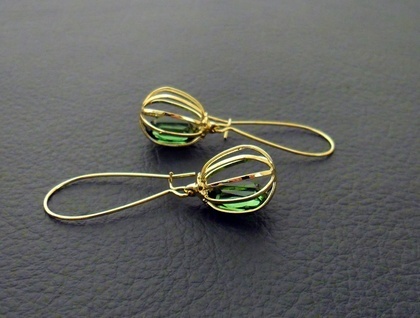 They are oval in shape, with multiple facets. Clicking on the largest photographs will enable you to view the earrings close up. 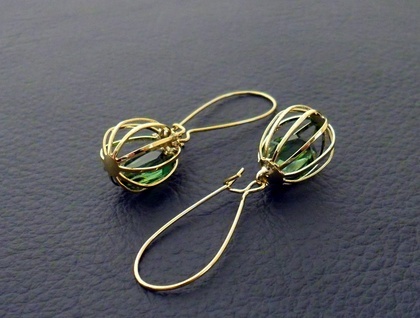 The 'gilded cages' dangle from kidney-shaped ear wires, which are made of stainless steel and plated with gold. These little beauties are a limited edition design, due to the rarity of vintage Swarovski crystals. They remind me of Christmas baubles, though they would be equally elegant and fun at any time of year. This is the second edition of the 'Captive Jewel' earrings: the cages are a slightly different shape to the originals, which have sold out. This is the last pair of these earrings available. The earrings measure 46mm from top to bottom. 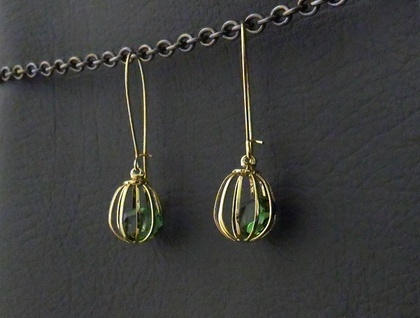 The cage charms are 17mm long, including the baile (hanging loop) at the top, and 14mm across.